They were a very short-lived gang. I love cruelty to the disabled. Woo. and that was very tastless and immature. it would be really cool if you could make the writing easier to read. A lot of writers use a white or black outline. By a deaf train on the Shabbath, the rest of my family were parking attendants. 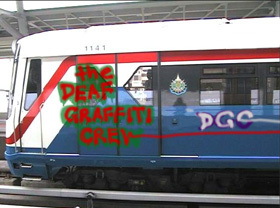 here are some photos of graffiti on a train that I took on Saturday in Frankfurt. Things around here are meant to be logical? it was a train passing on the track next to it? that works! that does work. the woo stands, but after appeal has been raised to a yay! the ewhole point of the joke. No offence ment. Amusing and evil! A big Woo to you! that made me laugh some !